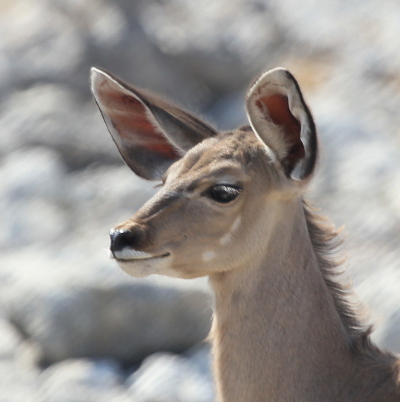 Namibia, May - July 2013 - Etosha National Park. 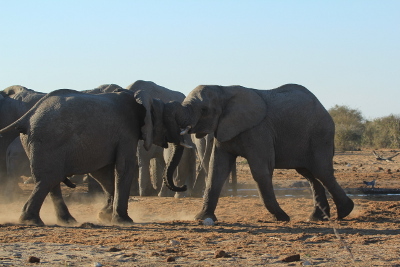 We spent 12 days in Etosha and stayed at each of the 3 rest camps. We were there just before the South African school holidays so all the campsites were quiet. 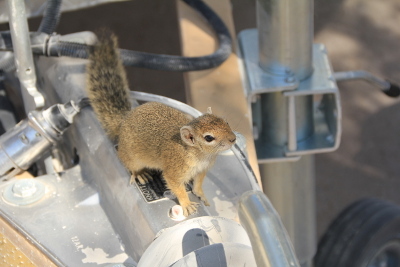 It was very dry but all the animals that we saw looked to be in good condition. I've managed to limit the photographs on this page to just over 20 but I did, of course, take hundreds! A lioness having a drink at Nebrowni waterhole with lots of animals keeping an eye on her. 3 ostriches walking across the dry pan. 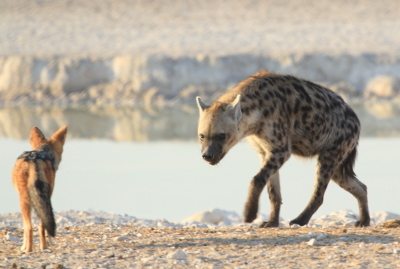 A hyena and a black-backed jackal. 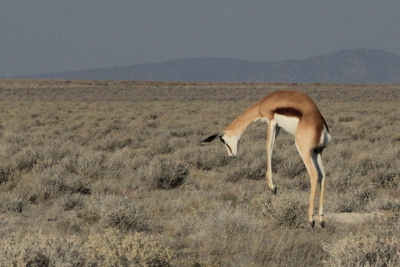 This springbok gave us a great display of 'pronging'. The waterhole at Okaukuejo camp was wonderful. During the day there was a constant stream of animals coming down to drink and then at night the waterhole is floodlit - it's really hard to drag yourself away from the waterhole sometimes! Zebra coming down to drink. 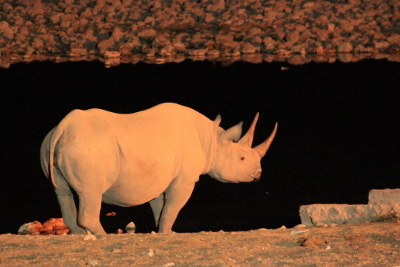 We saw black rhino at Okaukuejo every evening. Once we saw 6 around the waterhole at the same time. 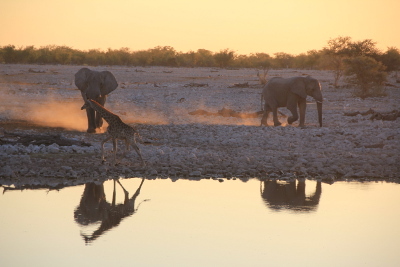 A couple of elephants hurrying down to the water one evening - and a young giraffe quickly moving out of their way. 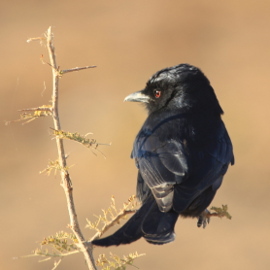 Birding was also great. 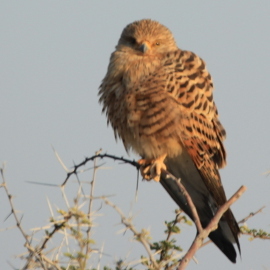 These photos are of a greater kestrel, a pair of tawny eagles and a fork-tailed drongo. 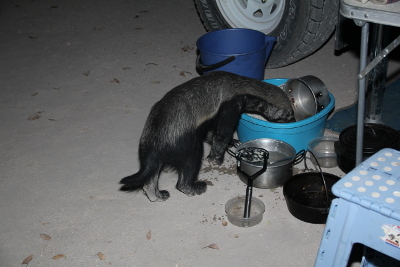 .... and we were visited by a honey badger in the evening. 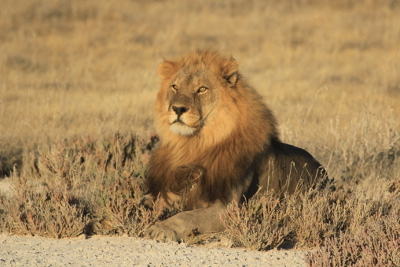 One afternoon we saw a lion and lioness sleeping in the bushes near Kalkheuwel waterhole. 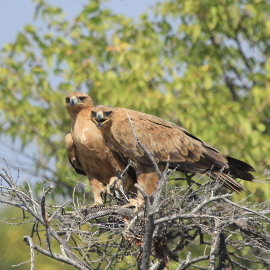 We returned the following morning and spotted them in an open area a couple of kilometres from the waterhole. We then spent the next hour and a half watching them. 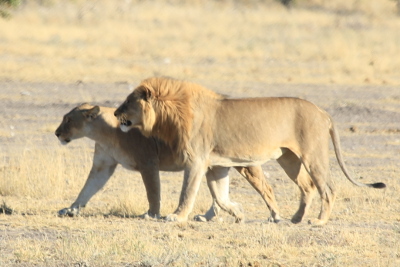 They would be lying down together and then the lioness would get up, closely followed by the male, they'd walk a little way and then mate before lying down again. This was repeated several times. They were a bit shy and tended to go behind some bushes to mate! 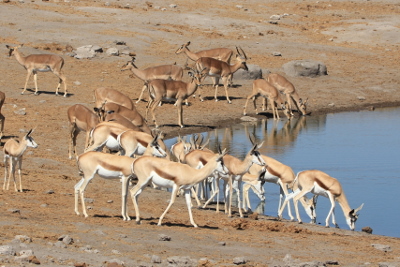 Springbok and impala at Chudob waterhole. 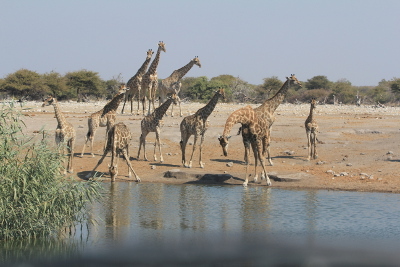 There were often lots of giraffe at Chudob. We saw lots of elephant families in the Namatoni area. These 2 'teenagers' were playing together. 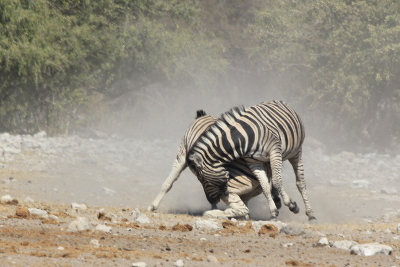 There were large groups of wildebeest and zebra on the open plains around Salvadora waterhole. 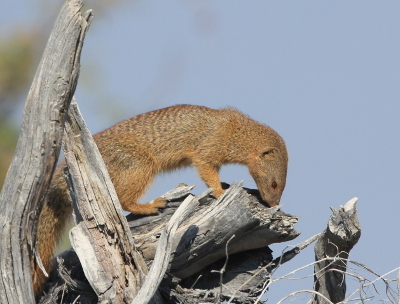 A mongoose looking for food. 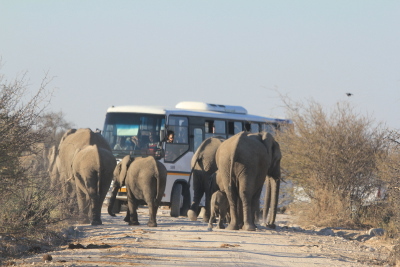 Elephants approaching Tsumcor waterhole and probably giving the passengers of this bus a bit of a fright. 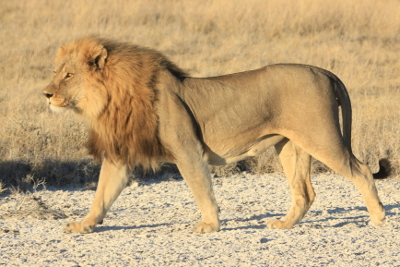 On our last morning in Etosha we saw 2 magnificent black-maned lions walking down the road towards us and then, as we backed up, they walked on either side of us for some time before lying down for a short while - wonderful!